Millions of people travel to Spain’s Costa Brava and Girona for a multitude of reasons. Rich history, relaxing on the beach and warm hospitality. But if food isn’t one of the main reasons to visit Costa Brava, it should be. There are countless amazing dishes and culinary treasures in and around Girona, from the super high end to the simplest of meals. After my visit to the region though these five are the ones I remember the most. 1. Pa Amb Tomaquet – When I first saw this at breakfast I thought someone had made a mistake. I’m used to a variation of this bread and tomato small dish with or before dinner and lunch, but a morning equivalent was new to me. The perfect tomaquet should include: olive oil, fresh bread, ripe tomatoes and salt. Then you cut the tomato in half and rub the cut side into the bread until it is well moistened with pulp. Drizzle with some olive oil, sprinkle some salt and your perfect Pa Amb Tomaquet has been created. At first it’s a little strange to enjoy the tomaquet with your breakfast, but by the end of your stay you’ll wonder how you ever lived without it. 2. 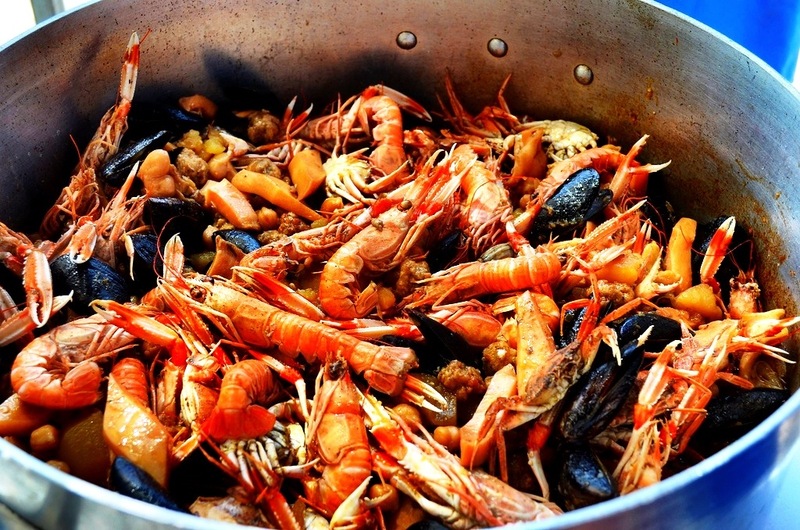 Seafood – While I personally may not be a big fan of seafood, I know that this culinary treat is what brings thousands of people to the Costa Brava every year. In and around Girona you will be presented with a sumptuous variety of watery treasures, from gigantic prawns to savory fish stews and everything in between. For the best Catalan experience, head towards a local fish shack for a home made feast featuring the popular dish Catxoflino. It’s a simple assemblage of langoustines, sausage or meatballs, mushrooms, onion and of course olive oil, but like any classic dish the magic of it rests with the individual flair added by the chef. When our group enjoyed this classic meal the chef was especially inspired and the table was soon in seafood ecstasy. Whatever you try though, it’s guaranteed to be fresh and delicious. 3. Aioli – If there’s one thing I learned in Girona, it’s that what I used to think of as aioli is merely flavored mayonnaise. 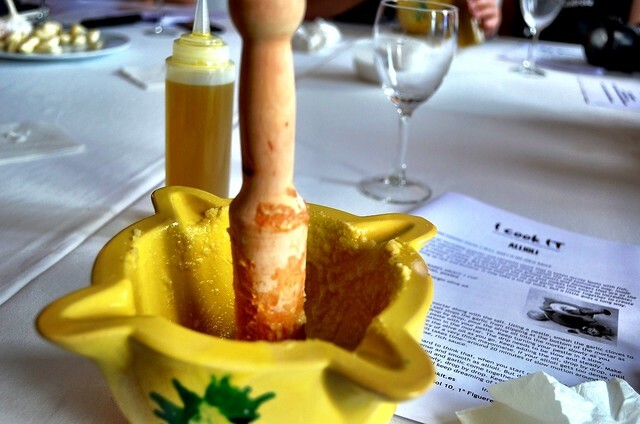 In Spain they take their aioli seriously, very seriously, and there’s a very particular and labor-intensive way of producing this spicy condiment. Garlic cloves are crushed using a mortar and pestle and gradually, over the span of thirty minutes or more, olive oil is added until the perfect thick aioli is created. For the novice, you should be careful when sampling this delicacy – a little bit goes a long way. The garlic condiment is spicy and adds a definite kick to just about any dish, from meats and cheese to seafood and it’s even a great snack on its own with fresh bread. 4. Charcuterie – Spain is famous for its fine meats, especially the rich variety of hams. Years are spent cultivating the perfect ham, which is then thinly sliced and assembled in a heap of meaty grandeur. 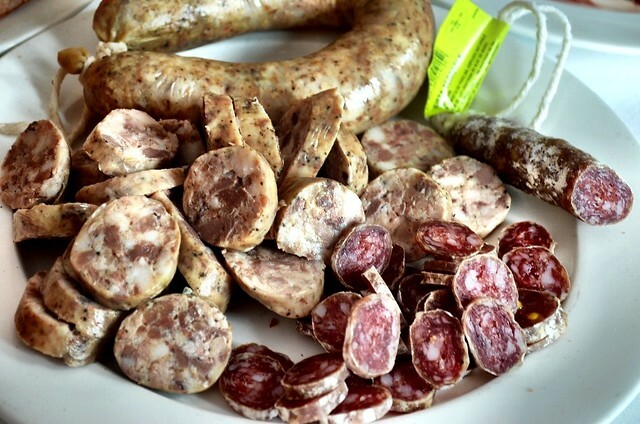 But ham isn’t the only form of charcuterie in Girona; you’ll find a carnivorous panoply of sausages, thin sliced meats and mystery portions that may be unknown, but are nonetheless delicious. With a little bread, tomatoes and olive oil this makes the perfect start to any meal. 5. The Porrón – You can’t visit Girona without trying some of the delicious wines found in this part of Spain. Wine is enjoyed at almost every meal, throughout the day and for no particular reason. Wine consumption is just a part of normal life, and indeed has been turned into an art form. One of the more unique ways of enjoying and sharing wine is through the porrón. A porrón is a traditional Catalan glass wine pitcher and resembles a cross between a wine bottle and watering can. This unusual vessel originated in the middle ages and was used when there weren’t enough glasses for the guests. Because, you see, this strange little glass tankard is meant to enjoy wine without your lips touching the bottle in any way. I wasn’t sure what to make of the odd serving vessel when I first saw it, and was completely taken aback when someone lifted it up and poured the red liquid into their gullets. The trick, it seemed, was to hold the porrón far enough away so that wine doesn’t cover one’s chest but close enough so that, you know, you can drink it. You may not become a porrón drinking expert during your time in Girona, but it’s a lot of fun trying. You are making me hungry and wishing I was in Spain. I would add the Tortilla to this list. We also have bread and tomatoes for breakfast in Romania, only we mix them up with some cheese. It’s a great way to start the day. Your article left me craving for seafood and wine! I’ve never heard of the porron before. I need to get one of those! OMG yum this post just made me want to be back there right now 🙂 Pa Amb Tomaquet was new to me too, but I definitely fell in love with it. If you’re there in winter, you should try deliciously messy calçots — onion shoots grilled over coals and eaten with a sauce called salvitxada — similar to Romesco.